Under the Radar's writers re-listened to many of 2010's notable albums, debated, and then each submitted a list of their Top 20 albums of the year. Those lists were all combined and tallied up to form Under the Radar's master Top 50 albums of 2010 below. This list also appears in our Year-End/Best of 2010 Issue, which is on stands now (until late-January 2011). 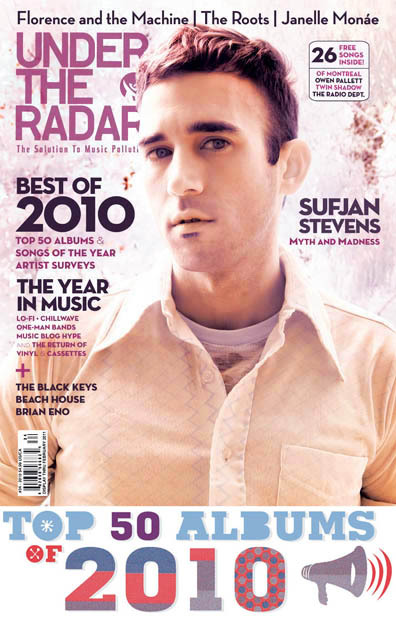 That issue also features interviews with many of the artists on our Top 50, including Sufjan Stevens (who's on the cover), Ariel Pink's Haunted Graffiti, Avi Buffalo, Beach House, The Black Keys, Caribou, Club 8, Delphic, Rose Elinor Dougall, Gayngs, Lost in the Trees, Janelle Monáe, of Montreal, Owen Pallett, Plants and Animals, Mark Ronson, Sleigh Bells, Tame Impala, Vampire Weekend, Sharon Van Etten, and Yeasayer. All of the 50 stuff in the lists are wonderful. Great job you did there dude. Wow! Sufjan Stevens The Age of Adz is on Top? Amazing! It is my favorite. I love the arcide fire - album, deserved the #2 spot.